Ki-84s and Ki-43s photographed on a former IJAAF base in Korea post-war. The Ki-84 in the foreground is from the 85th Hiko-Sentai, the next one in line belonged to the 22nd Hiko-Sentai HQ Chutai. Japan ruled Korea between 1905-1945. In August 1945, during the closing days of WWII, the USSR invaded the peninsula and the Soviet 25th Army advanced as far south as Seoul, before pulling back to the 38th Parallel, which was the pre-agreed division point with the USA. On 8 September 1945 (six days after the surrender had been signed aboard USS Missouri), an advance guard of the US Army’s 40th Infantry Division landed in southern Korea and began to disarm the Japanese there. This split of the peninsula set the stage for the Korean War which lasted from June 1950 – July 1953. The Japanese garrison in Korea had been relatively untouched by WWII until the final few weeks. As such, both the Soviets and the Americans captured vast quantities of equipment intact, which was then passed on to their respective North / South Korean client governments. The communists in the north were further aided by ex-Japanese weapons captured from the Japanese Kwangtung army and the puppet Manchukuo army during the short Soviet operation at the close of the war. Unwanted by the USSR, these weapons were transferred to either the North Koreans or Mao’s communist Chinese forces. The Chinese in turn re-transferred some Japanese equipment to the North Koreans, besides using it themselves. The Imperial Japanese Army had a fairly sizable fleet of warplanes stationed in Korea during WWII. During the final months, most were grounded for lack of fuel and trained pilots, and many were destroyed on the ground by the Soviets during their 1945 offensive. None the less, some remained and were used during the Korean War. The warplane below is a Nakajima Ki-43 “Oscar” fighter, which was the Imperial Japanese Army’s counterpart to the Navy’s “Zero”. Like the “Zero”, the “Oscar” was a good fighter during WWII. It had a top speed of 286kts. The drawing above is from a 1990s Russian magazine and is based on interviews with former Soviet “advisers” to the North Korean air force during the Korean War. Actually, the “advisers” were frontline Soviet pilots flying Chinese and North Korean planes, and were the toughest opponents of US Air Force pilots. These Russian veterans said that the “Oscar” above had been derelict at an airfield near Pyongyang since 1945. To their frustration, the North Koreans wasted a lot of time and effort in 1950 trying to get it back into combat-ready condition. Ultimately they never did and the WWII-veteran fighter was destroyed on the ground. Documents captured by the US Army during the Korean War spoke of the Ki-43 in the plural, so there were apparently more in North Korea’s possession at some point in time. The Ki-9 “Spruce” biplane trainer (below) ended up being the unlikely most-used ex-Japanese warplane of the Korean War. The Imperial Japanese Army had concentrated many of them in Korea and Manchukuo, where many were captured on the ground by the Soviets. Still more were captured intact by the US Army when it occupied the Busan area of South Korea in late 1945. The Ki-9 had a top speed of 129kts and by the time of the Korean War was hopelessly obsolete in any military role. None the less, it’s simple construction meant it weathered the lack of maintenance at war’s end better than more advanced types. It was also extremely easy to fly and made a good trainer for both the North and South Korean air forces. While the South Koreans used the Ki-9 as a trainer, the North Koreans also used it as a daylight reconnaissance plane during the Korean War’s first phase which lasted from June through August of 1950. After General MacArthur’s September 1950 amphibious assault at Inchon, the North Korean “Spruce”s were either destroyed on the ground or abandoned for lack of fuel and spare parts. It’s not thought that any were still in use when China entered the land war on 25 October 1950. The South Korean planes were phased out during late 1951 as superior American-built trainers became available. 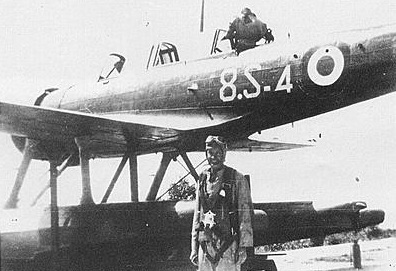 The plane below is a Tachikawa Ki-36 “Ida”. During WWII, the Imperial Japanese Army used it as an artillery spotting plane and light attack plane. This 1930s design was very obsolete by 1941 and the Japanese withdrew the “Ida” from the Pacific theatre, stationing them instead in Manchukuo, Korea, and Burma. North Korea operated at least two of these planes, both of which were destroyed during the Korean War. The Chinese air force also operated a pair, one of which survived the war and is displayed today in Beijing. Below is a Tachikawa Ki-54 “Hickory” of the North Korean air force. During WWII, the Imperial Japanese Army used the Ki-54 as a trainer for crews advancing to multiengine bombers. It could also be used as a transport. The “Hickory” had a top speed of 202kts and was powered by two Hitachi radial piston engines. It was not intended for combat. The Ki-54 “Hickory” was actually the first warplane operated by North Korea. 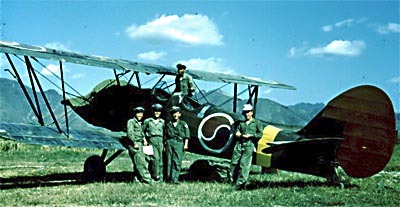 In 1945, the Soviets had presented some captured examples to the communist “Korean People’s Flying Society”, which morphed into the North Korean air force. As it had originally been a trainer, the Ki-54 was easy to fly and cheap to maintain, and the North Koreans used them regularly as staff transports. None were ever encountered in the air during the Korean War and none were seen at all after 1951. 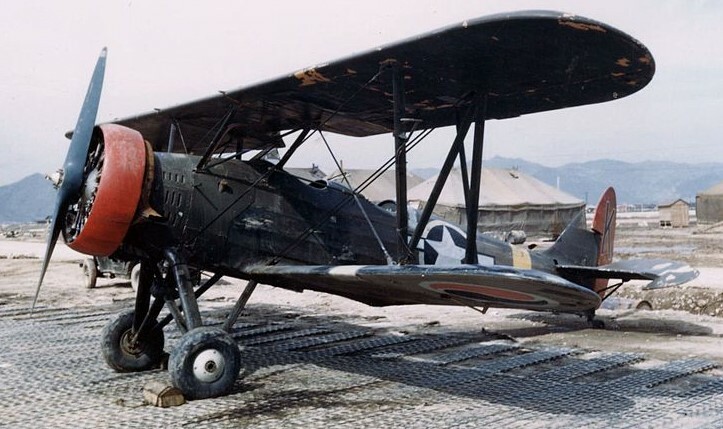 A 1950 United States intelligence document claimed that the North Koreans also operated Watanabe Ki-86 “Cypress” biplanes however none were seen during the Korean War. It’s possible that they fled north into China, or, that the intelligence was wrong. The official United States “tally list”, USAF HS No.81 of 1963 (which was declassified by President Clinton in 1995) concluded that no Japanese-made warplane attempted to engage an American warplane during the Korean War. Both sides used ex-Japanese airbases extensively during the Korean War. In South Korea, K-1 (formerly an Imperial Japanese Army airbase near Busan), K-10 (formerly the Imperial Japanese Navy’s Chinkai aviation station near Jinhae), Camp Walker near Daegu (formerly an Imperial Japanese Army airstrip), and K-3 (formerly an Imperial Japanese Army airfield near Pohang) are examples. In the North, the communists used the former Imperial Japanese Navy airstrip at Chongjin and an ex-Imperial Japanese Army airbase at Pyongyang. Near the Pyongyang facility was the former Showa Aircraft Works which North Korea seized intact and used to make spare aircraft parts until it was destroyed by American bombing. Below is a Type 38 mountain gun. This Imperial Japanese Army 75mm artillery piece was used extensively in China and Manchukuo, but was rarely seen in the Pacific theatre. A good number had been captured intact by both the Soviets and Mao’s communist Chinese in 1945; many of which were given to the new North Korean army. The Type 38 fired a 13lb shell out to 4 miles. It’s obsolete carriage made towing difficult by the 1950s and it was usually moved around as truck cargo, or just used as a static defensive gun. 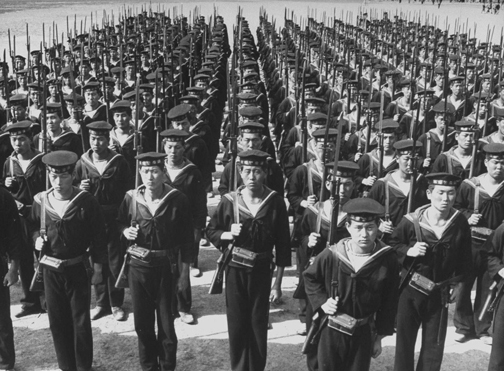 Both North and South Korea used the Type 38 during the war’s first phase between June to August 1950. After General MacArthur cut the communist’s north/south supply axis in November 1950, the North Koreans abandoned their Type 38s as ammunition resupply became critical, and “nonstandard” ammo like Japanese 75mm rounds were not worth the hassle. 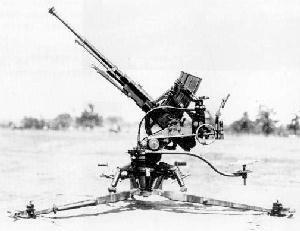 Below is a Japanese Type 98 anti-aircraft gun. During WWII, the Japanese used this weapon in every theatre of the war and a good number were still intact in Korea in 1945. Between 1946-1950, the North Koreans integrated them in a tactical-level AA asset. They were assisted by stockpiles of ammunition transferred from the USSR’s 1945 captures. The Type 98 fired the 20x142mm (Tracer) cartridge from a 20-round magazine. This gun had a theoretical range of 3 miles but about 1 ½ miles was more realistic. It’s ceiling was 11,500′ and it could elevate to +82°. By the 1950s, jets such as the F-80 Shooting Star and F-86 Sabre totally outclassed the WWII-era Type 98. The manual traverse, compared to the speed jets flew in the war, was barely enough time for the gunner to acquire a target before it was out of the slant range. Against high-flying B-29 Superfortress bombers the Type 98 was obviously useless. The Type 98 during WWII was moved on a wheeled carriage which (with the gun) weighed 836lbs. For use the wheels were removed and tripod legs extended. During the Korean War, another carriage was seen. It was an infantry mount developed either by China or North Korea. This was for ground-to-ground use only, which is not surprising considering the Type 98’s limitations by 1950. 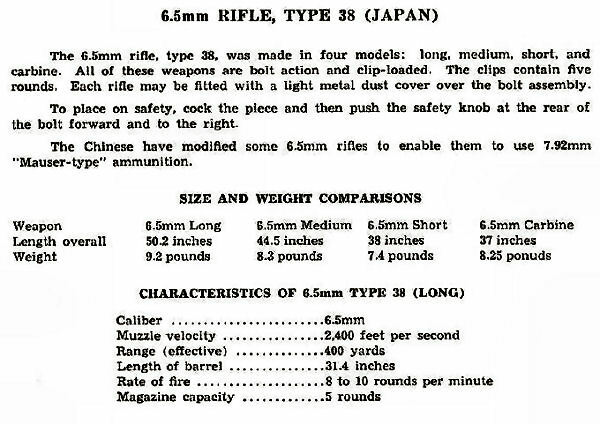 The Type 98 was mentioned extensively in US Army manuals during the Korean War but by the winter of 1951-1952, was rarely encountered anymore. There were two Japanese coastal artillery bases in Korea. One was near Rason in North Korea. It had been damaged by the Soviets in 1945 and was irrelevant during the Korean War. The other was near Busan in South Korea. During the defense of the Busan Perimeter in 1950, the fighting was to the north and west of the city and the southwards-facing guns were of no use. 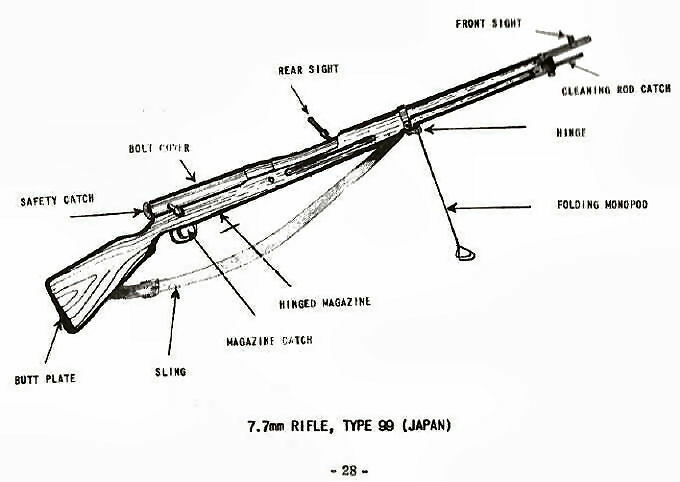 The Japanese Type 92 was a standard weapon of WWII. Many were captured by both the Soviets and Chinese in 1945, many of which ended up in the North Korean army by 1950. Besides the captured Japanese WWII-vintage ammunition, communist China captured intact a Japanese munitions factory in 1945 and manufactured it as well during the early post-WWII years. The full-auto Type 92 fired the 7.7x58mm Arisaka cartridge from a 30-round tin strip. A strip was exhausted in seven seconds of sustained fire, and a replacement had to be carefully laced into the feed which was time-consuming. As Japan began to run out of metal in 1945, cardboard was substituted and the North Koreans had examples of both tin and cardboard strips. The Type 92 jammed often due to feed failures, and the Japanese tried to rectify this by oiling the ammunition inside it’s transport boxes. During WWII, this actually increased the mechanical problems as the oil would pick up sand or dust and deposit it inside the gun. A silver lining for the North Koreans was that the oiled rounds from WWII were still perfectly preserved from moisture half a decade later. The Type 92 was accurate to about 850 yards and less accurate out to about 1,500 yards. The gun was air-cooled, with the fins on the barrel acting like a radiator. The tripod mound had two sockets for wooden poles so that it could be carried by the crew like a stretcher, ready for action. Many North Korean examples were missing the wooden poles. 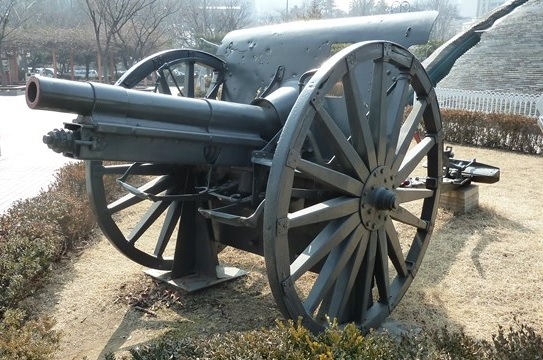 North Korean Type 92s were encountered off and on by American troops throughout the Korean War, but most commonly in the first six months and then again for the first eight or nine months after China entered the ground war. 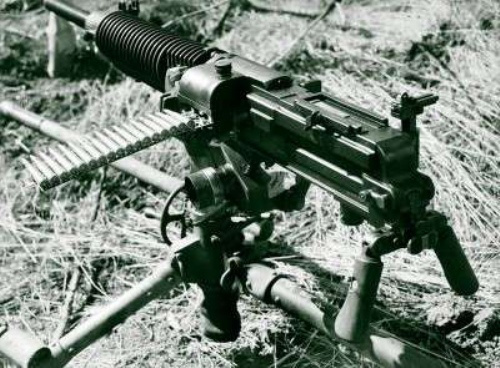 A less-commonly seen WWII Japanese machine gun was the Type 1. This gun fired the same ammunition as the Type 92 but from a 30-round feed tray. North Korean Type 1s were occasionally seen during 1950 and early 1951 but not much thereafter. The Meiji Type 38 was a standard Japanese rifle throughout all of WWII and was the most-produced Japanese firearm. About 3 ½ million were built before and during WWII, until production ended in 1944. The Type 38 was a bolt-action rifle which fired the 6.5x50mm Arisaka semi-rimmed cartridge from a five-round internal magazine. It was 4’2″ long and weighed 9 lbs. The Type 38 was, for it’s era, an excellent rifle. The design and weight was more than adequate to compensate for the 6.5mm round’s recoil. It introduced the sliding bolt cover, a characteristic of later Japanese rifles and carbines. The Type 38 had a good (2,400fps) muzzle velocity however the small bullet had limited stopping power. Many Type 38s had been captured by either the Soviets or Chinese, and then given to North Korea or retained by China. 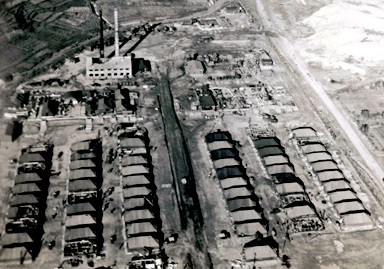 Additional stockpiles had been secured by the Americans in 1945 and given to South Korea. Both South and North Korea used ex-Japanese Type 38 in the late 1940s and into the start of the Korean War. The South Korean examples were phased out after the war’s first year however Type 38s showed up in North Korean and Chinese use throughout the Korean War, especially in the first twelve months. 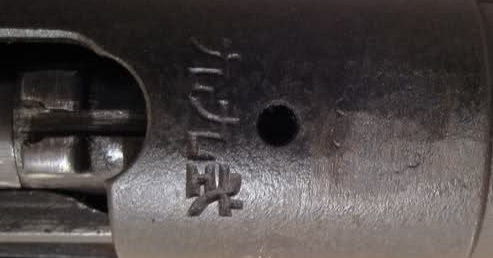 A small number of Chinese Type 38s had been rechambered for the 7.92mm Mauser round during the late 1940s. The objective was to increase the stopping power of the rifle however the effort was marginally successful at best, as these rechambered Type 38s had poor accuracy. By far and away, the most common WWII Japanese gun used during the Korean War was the Arisaka Type 99. Entering production in 1939 as WWII was starting, the Type 99 was intended to take the best features of the Type 38 and adapt them to the more potent 7.7mm Arisaka cartridge. The bolt action Type 99 weighed 8lbs and was fed from an internal five-round magazine. Like the earlier rifle, it was a good gun but it entered service as the worldwide switch to semi-automatics was starting. The Type 99’s bolt action was the same style as the Type 38 and the whole bolt assembly was of an excellent design; the National Rifle Association considers it one of the best bolts ever designed for a combat rifle. Many Type 38 features, including the bolt cover, were carried over to the Type 99. The “standard” Type 99 was 3’8″ long and there was also a “long-barrel Arisaka” version that was 4’6″ long. It was much less common. The Type 99 had some unusual new features. There was a folding wire monopod, and the rear sight had an anti-aircraft crossbar. The AA sight was found to be nearly useless during WWII and was laughable against Korean War jets. About 3 ½ million Type 99s were built, however it never fully replaced the Type 38 during WWII. At war’s end however, Type 99s were much more common than the Type 38 as captured equipment and hundreds of thousands ended up in the hands of the Soviets, Chinese, Americans, and the two Korean armies. 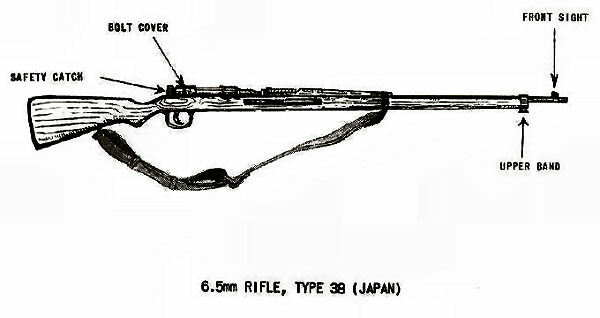 During WWII, ten different arsenals around Japan’s empire had manufactured Type 99s. Examples from every arsenal had ended up in every theatre of war, however two specific arsenals are of interest. Mukden Arsenal in Manchukou had made many, a good number of which were issued to the puppet Manchukou army or to Japanese troops in China and Korea. Meanwhile, on the Korean peninsula itself, Jinsen Arsenal in Inchon manufactured the Type 99 starting in 1941 and all the way up to the end of the war. Many of these were issued to Japanese divisions in Manchukuo, Korea, or China. Jinsen Arsenal also manufactured the bayonet for the Type 99. A word should be said about the Type 99’s manufacturing run. Rifles made 1939-early 1944 were of good quality. After the Leyte Gulf battle in October 1944, Japan’s worsening situation led to shortcuts, for example the buttplate was changed to a flat piece of cheap metal, the monopod was sometimes omitted, etc. Starting in the spring of 1945, the quality really fell off. Type 99s were manufactured with no buttplate at all (the shooter’s shoulder rested on wood), no AA sight, no finish to the wood, no treatment of the metal and/or use of substandard steel, the finger groove on the wood omitted, no monopod, no bolt cover, and a “drift” in the chamber dimensions of several hundredths of an inch. Many Type 99s made in the summer of 1945 were so bad they would have been rejected as unsafe had Japan’s situation not been so critical. When Japan surrendered in 1945, Jinsen Arsenal fell into South Korean hands. Most of the factory’s staff had been ethnic Koreans and in fact, the WWII manager became one of the postwar South Korean army’s first officers. A large supply of Type 99s, spare parts, and 7.7mm Arisaka ammunition was seized. These were promptly issued to South Korea’s new military. Meanwhile, the Soviets and Chinese had captured an absolutely colossal quantity of Type 99s. Both Mao’s communists and the new North Korean army readily adopted it. Mukden Arsenal in the city of Shenyang was in the hands of the Chinese nationalists between 1946-1948. During that time, the nationalists actually restarted production of the Type 99 for a while. First, WWII-version Type 99s were built suing leftover parts, and then a conversion called the North China Type 35 was started. It was a Type 99 chambered for 7.9mm Mauser rounds. Mao’s communists captured Mukden Arsenal in 1948, seizing many of the North China Type 35s, plus tool jigs to produce the Arisaka 7.7mm ammunition. They continued the conversion program for a while, with their rifles having a communist star proofmark. During the Korean War’s first few months, Type 99s were used by both sides but especially by the North Koreans. During the summer of 1950, the Arisaka was actually one of North Korea’s three main rifle types, alongside the Soviet-made Mosin-Nagant and SKS. Type 99s were very common in battle in the initial North Korean thrust, and featured heavily in the Chosin Reservoir battle of December 1950. The Chinese IX People’s Army, which fought the American X Corps, was a curious force that had many ex-nationalists in it’s ranks. These men had been “offered” the opportunity to avoid a communist POW camp by simply continuing their enlistment on the communist side. Many simply continued using their nationalist rifle, which was often a North China Type 35 or the original 7.7mm Arisaka Type 99. In 1951, the US Army occupation forces in Japan launched a project at Tokyo Arsenal to convert 130,000 Type 99s for the .30-06 Springfield cartridge. The objective was to arm “…a Korean gendarmerie” which would control the northern part of the peninsula, as it was predicted that the Korean War would end with North Korea’s complete elimination. The conversion was far from easy. Mechanically, the rear part of the barrel had to be cut back and the chamber extended forward about 0.197″ to accommodate the .30-06 Springfield, which was larger and longer than the 7.7mm Arisaka cartridge. This process was slowed by the fact that the 130,000 Type 99s chosen, a total of 6,650 were of the long-barrel version and the production jig had to be altered to convert it. The internal magazine also had to be reworked to accommodate the .30-06 and capacity fell to five rounds. The bolt had a notch cut in it to accept US Army-standard stripper clips. Finally, the imperial chrysanthemum emblem was ground off and the rifles were phosphated. Another issue was that the .30-06 Springfield generated more recoil than the Arisaka 7.7mm round and these converted rifles had a vicious kick. The biggest problem was the condition of the Arisakas to begin with. It was discovered that many were the “last-ditch” ones made in 1945, missing parts and with very sloppy workmanship. Overall, the whole project was a bust. According to the haphazard records kept, 133,150 Type 99s were involved however that doesn’t mean that number were actually finished, as some were abandoned midstream due to the “last-ditch” issues. The project was concluded in 1952. It does appear that some were issued to the South Korean army in 1953, but certainly not all. Many were just taken as souvenirs by American troops when the occupation ended in April 1952. Some of these had the “US CAL 30” stamp ground off to indicate they were no longer Army-approved weaponry. One of the most surprising types of the Korean War was the Jinsen Educational Rifle. These bolt-action rifles were manufactured at Jinsen Arsenal. They were not for training troops, but rather for training gunsmiths; sort of “practice pieces”. Loosely based on the 6.5mm Type 38, they are of very crude construction and often have features such as bayonet lugs, etc deleted. In place of the imperial chrysanthemum emblem, the words “to teach” are in a circle. The bolt cover carries a warning “Not For Live Ammunition” however almost every one observed after WWII had been fired. It’s astonishing that these uncommon weapons saw battlefield use during the Korean War. The total made or used is unknown, as Jinsen Arsenal was destroyed during the Korean War. Only about 100 are known to exist today. It is urgently advised not to fire a Jinsen Educational Rifle as there is a good danger of chamber rupture. Nambu pistols and Type 30 carbines were sometimes seen on the battlefield between 1950-1953. Both the North Koreans and Chinese used WWII Japanese Type 97 hand grenades. This one-pound grenade was known as “the headbanger” because to use it, the pin was pulled and the fuse was then armed by striking it on a hard object – usually, the soldier’s own helmet. It had 2.2 ounces of TNT and a five-second delay. A US Army handbook during the Korean War illustrated and described the Imperial Japanese Army’s Type 93 land mine, so apparently that weapon saw some use during the 1950-1953 conflict. The Type 93 had 2 lbs of high explosive and was pressure-activated. 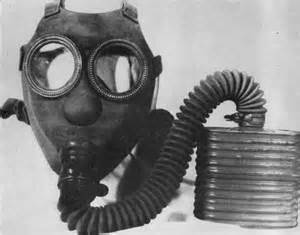 The North Korean army was critically short of gas masks and for soldiers lucky enough to get one, it was often a WWII Japanese Type 99. Chemical weapons were not used by either side during the Korean War. Other ex-Japanese gear, including Type M30-32 Tetsu-Bo helmets, popped up from time to time but were not common. A few relics of Japan’s WWII presence in Korea survive in military use today. For example the US Army’s current Joint Military Affairs Korea is housed in a building which was once an Imperial Japanese Army hospital during WWII, then briefly an attache office of the Soviet army during the immediate post-WWII period, then a US Army staff headquarters during the Korean War.